Prescribed fire: By definition, it’s an unpredictable game. But the seasonal Department of Natural Resources fire crew is a nomadic group, packed and poised to travel anywhere in the state where weather forecasts predict prime burning conditions. It’s an interesting life that keeps us on our toes. This year, drought conditions across much of the state put the brakes on our early-season burning and added adrenaline and urgency to the concentrated, lessened time we were able to burn. The result: an adventurous, marathon later-season burning-streak this month that set an Interagency Burn Team record for acres burned in a single week – 13 operations totaling more than 3,350 acres in four days – and gave us the chance to work with larger, more diverse groups, including The Nature Conservancy’s two seasonal crews and every Interagency Burn Team partner, from the Georgia Forestry Commission and The Orianne Society to the U.S. Forest Service and Fish and Wildlife Service. Learn more about this year's fire season in this first-person account by Hilary Smith. Hilary is a second-year member of the seasonal fire crew hired by the Nongame Conservation Section. The Game Management Section of DNR’s Wildlife Resources Division has ratcheted up its Rx fire totals in recent weeks. All told this year, Game Management has burned more than 22,000 acres, including some burns with the Interagency Burn Team. Prescribed fire is the most effective tool in conserving and restoring fire-adapted habitats that support numerous wildlife species of conservation concern. 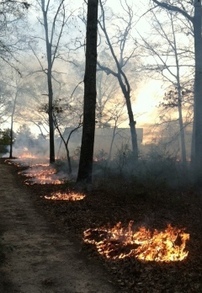 Nongame Conservation Section highlights this month included prescribed burns on Fall Line sandhills near Columbus, nearly 1,000 acres of Coosa Valley prairies, an old-growth longleaf pine unit at Moody Forest Natural Area, and tracts at Piedmont National Wildlife Refuge and Seminole State Park. The Nongame Conservation Section has burned almost 10,000 acres this year. 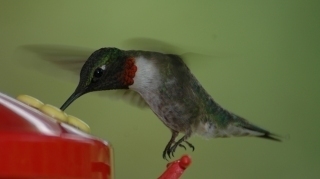 Although March 20 was the official first day of spring, many backyard wildlife watchers mark the season’s start by when they spot their first ruby-throated hummingbird. Homeowners in south Georgia usually see rubythroats around March 11. For those of us in middle Georgia it’s about March 21, and in north Georgia, the first of April. However, it has been my experience that, regardless of where people live in the state, most don’t see their first hummingbird of the new year until the first two weeks of April. Do these techniques work? Who knows? They can’t hurt (unless you fall off a ladder hauling a traffic marker up to the roof). However, here is a practical way to attract early migrants, plus some comments on what you can expect to see and the impact of the warmer-than-normal weather. Read more in this month's complete “Out my backdoor” column by Terry W. Johnson. 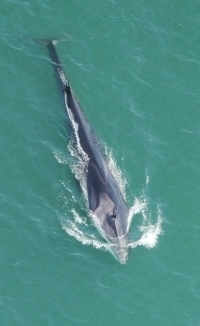 Florida Fish and Wildlife Conservation Commission biologists flying an aerial survey for North Atlantic right whales along Georgia’s coast March 17 saw an unexpected visitor: a 60-foot-long fin whale spotted 17 miles east of Sapelo Island. Two days later, the survey team made a second fin whale sighting – possibly of the same animal – 10 miles east of Blackbeard Island. Fin whales are extremely rare off Georgia’s coast. Whale survey teams have reported them only twice before, in 1996 and 2000. Reaching up to 85 feet and 80 tons, the fin whale is the second-largest animal in the world, close behind its larger cousin, the blue whale. Fin whales are found in all oceans, most commonly in temperate and polar regions. During summer, they feed in the high latitudes on krill, squid and small schooling fish. Fin whales presumably migrate to warmer waters and fast during winter months, but their migratory routes and behavior in winter are poorly understood. The Northwest Atlantic sub-population of fin whales is an endangered species, and only about 1,600 exist. Once decimated by commercial whaling, the primary threats now facing fin whales are entanglement in commercial fishing gear and ship collisions. Nongame Conservation Section biologist Clay George works with North Atlantic right whales and other marine mammals. A teenager fishing near Ringgold last December landed a discovery – the first hellbender documented from a northwest Georgia stream since 1959. The hellbender that Hunter Owens (right) inadvertently hooked not only caught herpetologists’ attention, it served as an ambassador for North America’s largest salamanders at one of Georgia's most successful conservation fundraisers. Read more on our blog. White-nose syndrome reached its farthest point south with last week's news the disease that has killed more than 5.5 million bats had been documented in Alabama. Surveyors found infected bats in the Russell Cave complex in Jackson County, a northeast Alabama county that borders Georgia and Tennessee. Nongame coastal staff recently burned Little Egg Island Bar to reduce vegetation and improve habitat for ground-nesting sea- and shorebirds. This protected sand island in the mouth of the Altamaha River supports significant numbers of eastern brown pelican, American oystercatcher and royal and sandwich tern nests. Watch this video including Little Egg Island Bar and former Nongame Program Manager Brad Winn. Not yet 3 months old, the Georgia Outdoor Recreational Pass has funneled $43,000 into needed maintenance projects on nine state wildlife management areas, plus some public fishing areas. More work is being planned, thanks to the new pass. Got an opinion about expanding access to wildlife management areas? DNR’s Wildlife Resources Division is seeking public comments for a federal grant that could provide more than 15,000 acres of new hunting and fishing opportunities, plus compatible recreation like birding and hiking, through participating landowners. Snakes alive! They certainly were at last weekend’s Claxton Rattlesnake and Wildlife Festival. The 45-year-old event featured more than 200 snakes, from eastern diamondback rattlers to eastern indigos, in a new focus that abandoned the former roundup’s practice of harvesting wild-caught rattlesnakes. The combination of more wildlife – the snakes were provided from captive sources – and educational outreach “hit a home run,” said Bruce Purcell, president of the Evans County Wildlife Club, which organizes the festival. Purcell estimated the crowd at 18,000, about 2,000 more than expected. 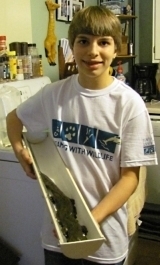 He praised DNR’s support, and said the hope is to expand wildlife education aspects next year. 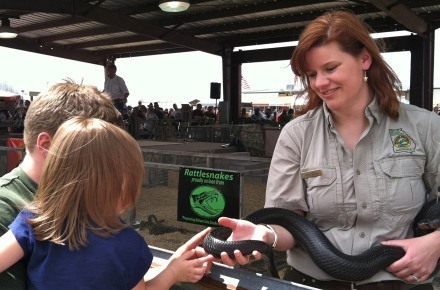 Above, Linda May, Nongame Conservation Section environmental outreach coordinator, shows a federally protected eastern indigo snake to festival visitors. More photos on Flickr.